Pressing the brake pedal in your car should give you the sense of security that it will set in train a sequence of events which will slow down your car smoothly and safely. You certainly shouldn’t immediately hear any untoward brake noises, and your car should pull up in a straight line - provided you keep hold of the steering wheel. But when you press your foot on that pedal, you start off a process which involves both mechanical and hydraulic parts working in harmony. If you have brakes making noise when stopping, the cause could be coming from either of these sources. And no matter how fastidious you are about maintaining your brakes, there are parts involved which are subject to good old wear and tear, and thus deteriorate with regular use. What Happens When I Brake? In short, your foot’s pressure on the brake pedal works a hydraulic piston. The force from the fluid in this piston causes a caliper, to which a pair of brake pads are attached, to apply pressure to a rotor. This progressively slows down the wheel, and will eventually stop your car. The force with which you put your foot down on the brake pedal should vary the amount of braking force which is applied and therefore, how quickly your car can stop. This operation should create minimal noise - at least which is audible from inside the car. The material from which your brake pads are made is amazing. To start with, it works in pretty demanding conditions, and is expected to keep working with the same effectiveness and consistency in a variety of scenarios. The ability of the material to provide smooth, even contact with the rotor or drum (rather than a material that breaks off in chunks or causes pits or dents). 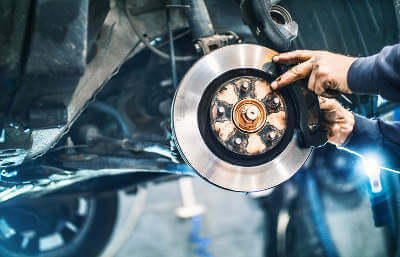 If you hear any noise which sounds like metal grinding against metal, then you should take that as a warning sign that you should at least have your brakes examined, and you may need to have some parts of them replaced. Many brake calipers are fitted with a piece made of a soft metal which is intended to work as an indicator that the pads attached to them need to be changed. If you hear a more metallic grinding noise, that means your brake pads are worn down to the metal, and this is coming into direct contact with the rotors we mentioned earlier. Not only is this likely to damage those rotors, it’s also greatly compromising the effectiveness of your brake system. There’s no getting away from the fact that brake pads wear down with use, and will in time need replacing. But some noises which you might hear from your car’s brakes could be temporary - especially if you leave your car unused for a long period, and it’s exposed to a lot of rain water. Once your pads have reached the stage when they are grinding every time you put your foot on the brake pedal, you may as well start throwing £5 notes out of your car. That grinding noise is trying to tell you that your brakes are past the point when they should be replaced. And as well as the need to replace the calipers, pads and rotors on your brakes, you’re also likely to need CPR of another kind yourself - cardio-pulmonary resuscitation - when you see the size of the bill you’ve racked up! Another kind of brake noise you might hear is that which comes not from the front of your car, but the back. Instead of disc brakes, many cars, but more particularly older models, have drum brakes at the rear. In these, a brake shoe is pressed against the rim of that drum on the inner edge of a car’s wheel when you engage your handbrake. While this means the pressure applied when you pull the lever is nowhere near as high as when you lower your foot on the brake pedal, it does mean that the brake is engaged for much longer than your front brakes. As a result, especially if a car is left stood for any great length of time, tiny particles of rust can build up, both on the outer drum and the surface which comes into contact with it when the handbrake is engaged. This means that drum brakes require skimming at occasional intervals, so that the pitted and debris-covered outer surface is ground down, leaving a smooth new surface for the outer drum to attach itself to. A drum brake may have a tiny groove, invisible to the naked eye, cut into it by the process of regularly applying the brake. This can make the surface of the drum a little like that of a vinyl record. If a brake shoe then comes into contact with a surface which is worn in this way, it can force the shoe to break away from the metal, and hit the backing plate. As this noise is caused by this happening many times a second, the result can be a knocking or thumping noise which will really start to bug you! The best solution to this is to have the rear drum brakes replaced, so you eliminate the sound - it’s a longer and more expensive job than replacing the front pads, but could be the answer to your problems, and leave your rear brakes good for several tens of thousands of miles more. If you hear this noise, the experts reckon it’s most commonly caused by having cheap or inferior brake pads fitted. This is because these pads often include small flakes of metal in their formulation, and even when you press the brake pedal lightly, this can loosen some of these tiny particles. If these then drag along the surface of the rotor, this can emit a squeaking noise. So choosing good quality brake pads in the first place can remove the chances of this happening. If your brakes start squeaking while you’re driving down the road, but the noise goes away when you press on the brakes, it might be that a brake wear indicator is hitting the rotor and causing the noise. The wear indicator is a small metal tab fastened to the brake pad, designed to show a mechanic when the pad needs replacing. Because pads are generally quite thin, you shouldn’t ignore this noise, as it’s likely to soon be followed by some of the more serious grinding sounds we described earlier. The message from all this is clear - any noise, or hint of unusual or ineffective operation of a car’s brakes, needs to be looked at by an experienced mechanic - and done as soon as possible after the first hint of any problem. Some car problems - a chip in your windscreen, say, or a worn windscreen wiper blade - may go without being attended to for a few weeks. But if you encounter any of the symptoms described earlier in this article, you should get your car examined by someone who knows what to look for, and can get to the root of the problem. Don’t wait until you hear any of the obvious signs of brake problems described in this article before getting them looked at. If you’re the owner of the vehicle, it’s your responsibility to get brake repairs done before they start putting other people at risk. Post your requirements with MyCarNeedsA.com, and you can choose which brake repair specialist you use from the quotes submitted by our repair partners, who are also rated by customers who have used them.